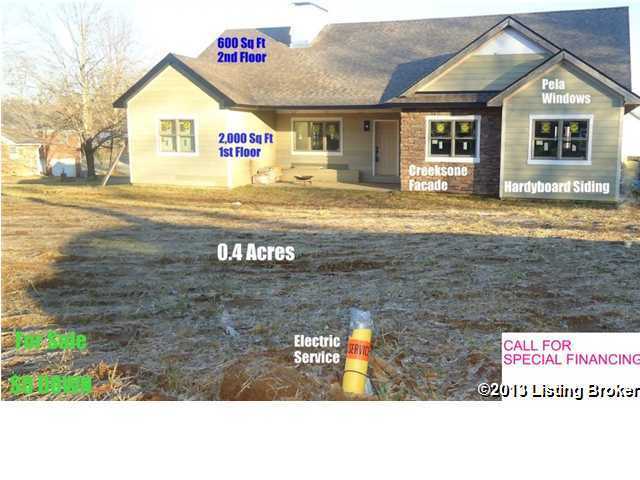 This is a partially finished home for sale, exchange, partnership, or other creative form of acquisition in Louisville, Kentucky with a very flexible and easy to get along with seller. It sits on a deep crawl space. Details of the finish can be seen on the photos and video. Approximate costs to date, $30,000 for land acquisition including tear down and disposal of old house; $120,000 for construction and materials; $68,000 retail price of high end kitchen cabinets identical to those in home of Robertson of A & E Duck Dynasty fame. The HVAC system is already installed, except for the compressor which is purchased. The septic system is installed and inspected, but not connected to the inside plumbing, Water connected (from old house). Electricity completed but not inspected. Direction: Smyrna Road to Cooper Chapel. 5719 Cooper Chapel Rd, Louisville KY 40229 is a Home, with 4 bedrooms which is recently sold, it has 2,600 sqft, 0 sized lot, and 1 Car Garage parking. A comparable Home, has 3 bedrooms and 2.5 baths, it was built in and is located at 4602 Summit Dr #A Louisville KY 40229 and for sale by its owner at $ 146,000. This home is located in the city of Louisville , in zip code 40229, this Bullitt County Home, it is in the NONE Subdivision, and HERITAGE CREEK are nearby neighborhoods.